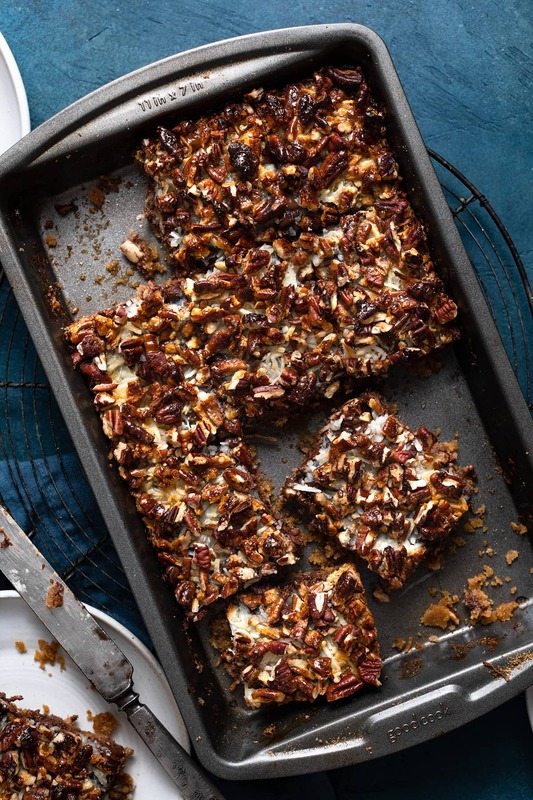 Magic Cookie Bars are one of the easiest desserts you can make! 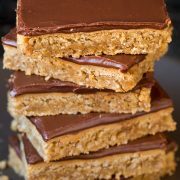 Layered with butter graham cracker layer, chocolate chips, coconut and sweetened condensed milk. A dangerously addictive treat you’ll want to make again and again! 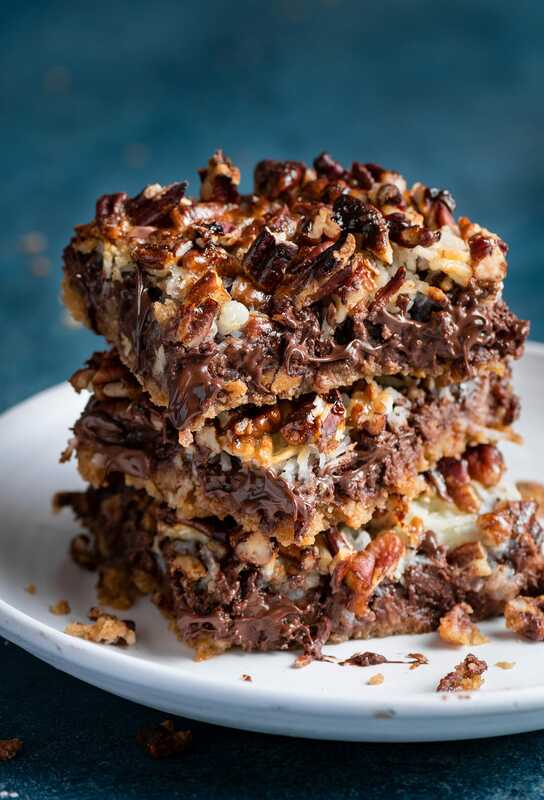 Magic Cookie Bars with so Many Layers of Decadence! 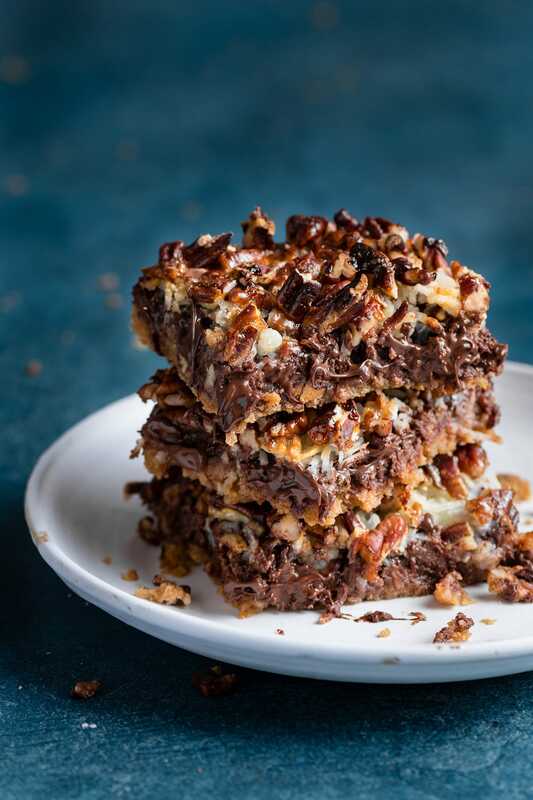 These 6 layer bars (or as some refer to as 7 Layer Bars) are a dream come true! There’s just so much decadence in this one simple dessert and people of all ages always love them. You’ll love there’s nothing complicated here and they don’t take too long to make. Just be warned these things are dangerously addictive! As in you may have this great plan to eat a tiny square and gift the rest, not gonna happen. It will be more like the other way around! 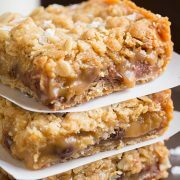 Some magic bar recipes use just chocolate chips, others include white chocolate and butterscotch chips. 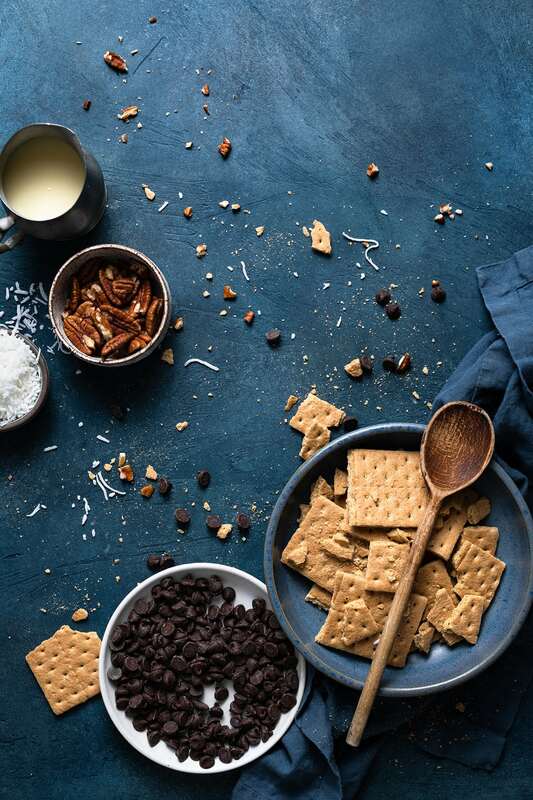 For me personally I’m all about chocolate so that’s what I went with here but feel free to use what you like, I bet even those peanut butter chips would be delicious here. 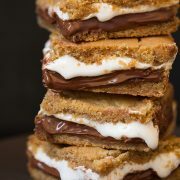 When I first made these I didn’t like how the graham cracker layer was so incredibly thin that it almost didn’t even cover the bottom of the pan so now I use an additional 1/3 the mixture (as is listed per this recipe). I also prefer the sweetened condensed milk poured over the top as it seems to bind it all together better (rather than pouring it over the graham layer then adding the remaining toppings after). 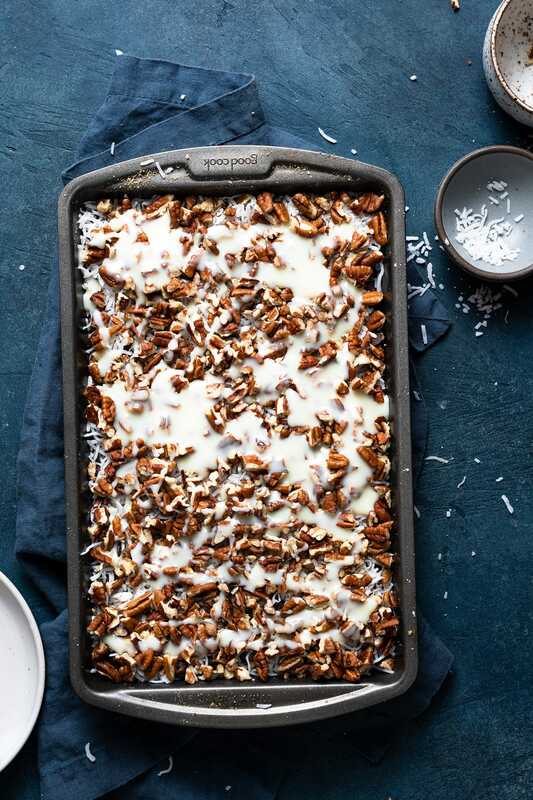 What Ingredients go Into Magic Cookie Bars? Unsalted butter – salted butter will work here too it will just add a bit of saltiness to the crust. Crushed graham crackers – to crush place in a bag and crush with a rolling pin or blitz in a food processor. Chocolate chips – you can use semi-sweet or milk chocolate chips here. I like a blend of both. Sweetened condensed milk – this helps bind the layers. And isn’t it just one of the best ingredients? Sweetened shredded coconut – unsweetened coconut would work here too if that’s what you have. Stick with medium shredded (not fine or large flakes). Walnuts or pecans – I like to use pecans but walnuts are another great option. You can even buy the pre-chopped ones. Melt butter in a 13 by 9-inch baking dish in oven. Tilt melted butter around pan. Add graham crackers and toss to evenly coat with melted butter. Press into even layer. Sprinkle chocolate chips evenly over graham cracker layer followed by coconut and pecans. Drizzle sweetened condensed milk evenly over top. Bake until lightly golden, about 25 minutes. Do I Have to Own a Mixer? Not with this recipe, I love that these don’t even require a mixer! 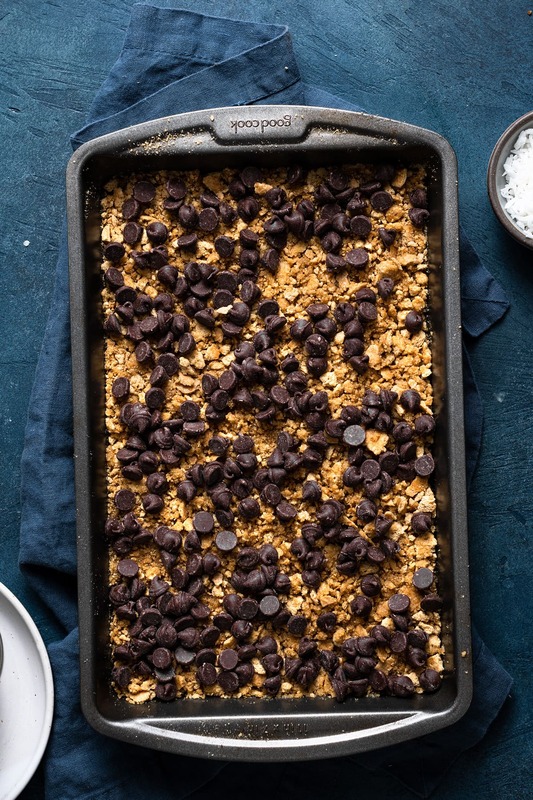 Everything is literally just added to a baking dish and the only thing that even requires a little mixing is the graham cracker and butter – other than that everything else is just sprinkled or poured one layer after another. Can I Use Pre-Crushed Graham Crackers? Yes! If you buy the boxed graham cracker crumbs you won’t even need to crush up the sheets of it first. More Easy Dessert Recipes to Try! One of the easiest desserts you can make! Layered with butter graham cracker layer, chocolate chips, coconut and sweetened condensed milk. A dangerously addictive treat you'll want to make again and again! Preheat oven to 350 degrees. Place butter in a 13 by 9-inch baking dish, add to oven and allow to heat until melted (mine took a little over 2 minutes). Remove from oven, tilt pan side to side to allow butter to run about 1-inch up the sides of the pan. Add graham crackers and toss to evenly coat with melted butter. Firmly press mixture into an even layer in pan. Drizzle sweetened condensed milk evenly over top. Bake in preheated oven until lightly golden, about 25 minutes. Cool completely on a wire rack then cut into bars. Store in an airtight container. I like to use 1 cup semi-sweet chocolate chips and 1 cup milk chocolate chips. For best results don't use low fat or fat free sweetened condensed milk.